The city of Werribee is approximately 30 minutes drive from Melbourne's CBD. The Rotary Club of Werribee meets every Tuesday. The meeting commences at 6:45pm and concludes at 8pm. 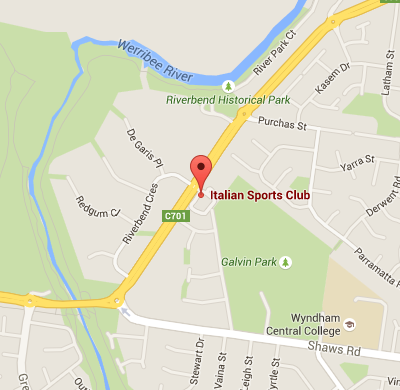 Our new venue is the Italian Sports Club at 601 Heaths Rd, Werribee. Occasionally we meet at an alternative venue depending on the type of meeting being held. President welcomes everyone and introduces any guests including the evening's speaker. Club members make any announcements that their colleagues need to be aware of. This normally relates to information or updates about club projects. A light-hearted fine session, conducted by the Sergeant-At-Arms, for any misdemeanors by members or humorous events that have occured.